Giant Mexican Tin Star Light - Natural Punched Tin - 36 inch dia. This giant natural tin hanging star lighting is designed to create elegant lighting focal point to accent your southwest or Mexican decor. 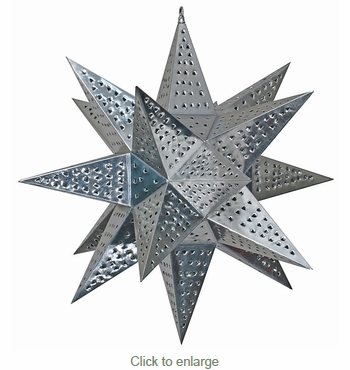 Use this giant natural tin star in an entry way or as the center piece of any room. All of our Mexican metalcraft star fixtures are authentic creations handmade by artisans in Mexico.